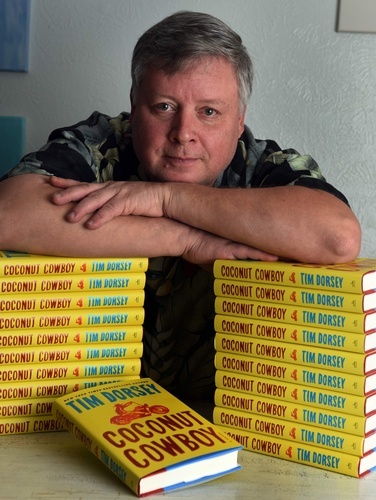 Best-selling author and Florida resident, Tim Dorsey, will be visiting the Destin Library on Tuesday, April 30th (5:30-7:00 PM). Prior to speaking the author will sign books and have available, for sale other merchandise associated with characters from his stories. This program is free to the public. Seating will be limited. Tim Dorsey moved to Florida at the age of 1, growing up in a small town north of Miami. He graduated from Auburn University in 1983. Between 1983 and 1987, Dorsey was a police and courts reporter for The Alabama Journal. In 1987, Tim Dorsey joined the Tampa Tribune working as a general assignment reporter and later as a political reporter in the Tribune’s Tallahassee bureau. In 1999, Mr. Dorsey left the Tribune to write full time. Tim Dorsey has published twenty-five novels since 1999. His most recent works include Non Sunscreen for the Dead (2019), The Pope of Palm Beach (2018), Clownfish Blues (2017) and Coconut Cowboy (2016). Further information on Mr. Dorsey’s schedule can be seen at www.timdorsey.com.